A NEW YORK TIMES BESTSELLER • President Reagan's dramatic battle to win the Cold War is revealed as never before by the award-winning anchor of Special Report with Bret Baier. 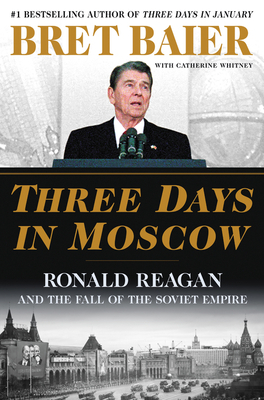 Moscow, 1988: 1,000 miles behind the Iron Curtain, Ronald Reagan stood for freedom and confronted the Soviet empire. Bret Baier is the chief political anchor for Fox News Channel and the anchor and executive editor of Special Report with Bret Baier, seen five days a week on Fox News Channel. Before assuming the anchor role, Bret served as Chief White House Correspondent for Fox News Channel between 2006 and 2009. Prior to being named Chief White House Correspondent for Fox News Channel, Bret served as National Security Correspondent based at the Pentagon, reporting on military and national security affairs, as well as on defense, military policy and the intelligence community from 2001 to 2006. He reported from Iraq twelve times and Afghanistan thirteen times. In his career Bret has traveled the world with various administration dignitaries and military officials, reporting from seventy-four countries. He is the author of the New York Times bestsellers Three Days in January: Dwight Eisenhower's Final Mission and Special Heart: A Journey of Faith, Hope, Courage and Love. He lives with his family in Washington, DC. Catherine Whitney is a New York-based writer who has written or cowritten more than forty books on a wide range of topics. She is the author of The Calling: A Year in the Life of an Order of Nuns and the coauthor with nine female U.S. senators of Nine and Counting: The Women of the Senate.